Hi there! I’m back today with a different card made using: Lawn Fawn’s Fintastic Friends stamps and dies, Lawn Fawn Striped Backdrop Die, twine, Spectrum Noirs, Spellbinders Circle Dies and papers by Lawn Fawn and Craft Asylum. 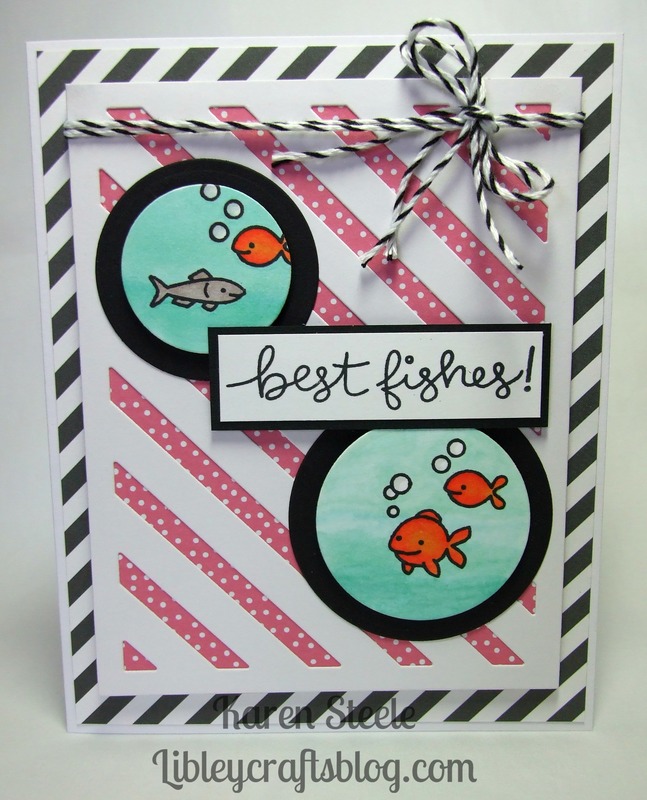 I know that I have used the backdrop die the same way as yesterday’s card – and the other cards that will be featured this week are the same – but I just liked using it like that! I’ll be more adventurous in the future! Another adorable card with this set, Karen! So much fun!!! It’s sure to make someone’s day! It’s nice to see it used in the same way but with different elements. That’s what everyone who owns it will be doing after all! Lovely card. Even the sharky-looking one is cute! So cute with the little fishes! Love all the stripes and twine, too! Fun with the stripes going in every direction and the fish bowl image is sweet.